The Down the River Clean Up is scheduled for Sept. 9, and it's not too late to sign up. 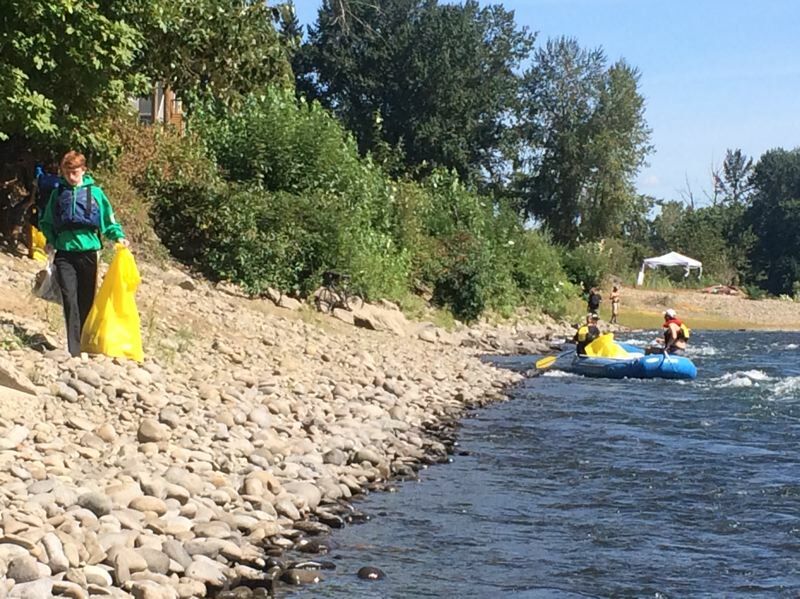 Organizers with We Love Clean Rivers expect more than 300 river aficionados to pilot their rafts, kayaks and other craft along more than 20 miles on the Clackamas River, picking up trash in the process. Volunteers will launch from four parks on the river — Milo McIver, Barton, Carver and Riverside — ending up at Clackamette Park in Oregon City for a barbecue and awards ceremony. Nonboaters may pick up trash or supervise activities at each of the four parks. More information and registration forms for the event are available at welovecleanrivers.org/clackamas-down-the-river-clean-up-sep/volunteer. Alix Danielsen, event coordinator for We Love Clean Rivers, said she has been involved with the cleanup for only three years but knows that most people who attend the event have been doing so for the last 16 years. "There are people who come back year after year because they are dedicated to the river and the recreation they find there," she said. She noted that first-timers have an incredible experience at the event and tend to show up the next year, ready to take part again. "There truly is fun and purpose to be found by anyone at this event," Danielsen said. People should participate in the cleanup "to protect the water quality and habitat health of a river that is home to threatened and endangered wildlife species and provides drinking water to almost 400,000 people," she said. She added that the event is an active way to engage with and give back to the Clackamas River. Last year about 250 volunteers picked up 3,800 pounds of trash from the waterway. Trash in the river harms wildlife and humans in many ways, Danielsen said. "Trash can impact wildlife by physically changing their habitat, depleting oxygen levels in the water and causing the accumulation of harmful chemicals," she said. When fish and other aquatic species end up ingesting small pieces of trash, it can be fatal, Danielsen said. People who visit the Clackamas River experience trash from several different sensory angles, she said. "As trash builds up on beaches and along the bottom of the river, it affects how recreationalists experience the river: the risk of injury increases, the risk of exposure to harmful bacteria increases, and the aesthetic pleasure that people get from being on the river decreases." Volunteers without access to watercraft can still take part in the Down the River Clean Up, Danielsen said. They can sign up to pick up trash at the four launching site parks, which only takes a few hours. There also is a need for sorter captains and sorter assistants. "These folks show up in the early afternoon and are stationed at the dumpsters at each of the take-out parks, Barton, Carver, Riverside and Clackamette," Danielsen said. They receive the trash bags that the on-river volunteers bring down the river and make sure they are sorted correctly in the dumpster. "This ensures that we send the dumpsters to the waste facility in the correct manner, and ensures that we're able to recycle as much as we possibly can of the trash that comes off the river." Details: Boaters must have Class II+ whitewater experience, provide all their own gear, a shuttle to and from their put-in/take-out parks, and wear a life jacket. Water and land volunteer opportunities available. Scuba divers and free divers also welcome.